The tough teenage stuff has started to trickle it's way into our house. Sorry, mister. Not in this house. Ryan and I knew it was coming eventually so we were prepared. He told us he had pierced his own ear before and when I was shopping with him he stopped to admire diamonds and asked to buy one. "First, you can't buy just one earring in a fancy jewelry store. Second, you don't have enough money. Third, your ear is not pierced and will not be for a long time. And finally, if you are going to spend so much money on earrings they are going to be for me!" I really don't think he was trying to be defiant by piercing his own ear. He saw safety in numbers. 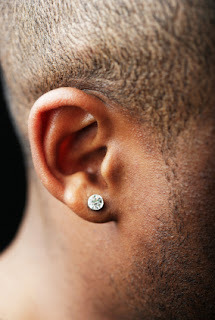 W came up the stairs not 5 minutes later with a giant sparkly earring in his ear as well! If I were him I would have done the same thing! Two of them against one of me! And really it was only W's second day in our home! How could I say no to a new child? Sorry boys, but I know the tricks - after all, the little ones try them out just about on a daily basis, just with different mediums so I have years and years and years of experience! I almost feel sorry for the boys. I am not worried they will not like me and I am not scared of them so they will have to find other ways to break me! It is very difficult explaining to a 16 and 17 year old from different cultures who are not a native speakers of your language that this is not acceptable in your house. I don't want the boys to be judged by piercings and tattoos and all of that. They are going to have a hard enough time as it is living in a predominately white conservative area!